How to start an automated network boot/install of a Non-Windows asset taking no more than 15 minutes and a ~3 MB download. The objective of this document is to show you how to PXE boot/install Linux and BSD distributions, Native Hypervisors, Recovery/Backup/Test Tools, Firmware updates, DOS/FreeDOS, and more. 1.1.2 Install CD/DVD/ISO of the non-Windows systems you want to network boot/install. In previous PXE/BINL application notes (Serva PXE/BINL - AN01: Windows Install & Serva PXE/BINL - AN02: Windows Install Adv & WinPE Boot) we have seen how Serva PXE/BINL services were able to automatically convert into Serva assets Microsoft Windows Install Distributions and Windows PE executives. In those cases the high degree of automation achieved is based on Microsoft's install distributions and PE executives standard format. Copy the non-Windows distribution file components and directory structure under Serva's class directory \NWA_PXE\ within the corresponding manually created head directory. In a few indicated cases Serva will require you to copy the distribution ISO/IMG file itself without extracting its components. Inform Serva about the presence of a non-windows distribution by manually creating the corresponding ServaAsset.inf file within the asset's head directory. Depending on the particular asset manually perform the required preparation processes (if any). 2.2 The file ServaAsset.inf is a simple, pure ASCII, text file containing the net boot/install information requiered by PXESERVA and the asset's booting/installing process itself. i.e. On supported browsers you can "Select All" by double-clicking anywhere within the file text area. When copying and pasting the content to i.e. Notepad.exe remember saving it as TXT document with ANSI encoding (default). The ServaAsset.inf format has been carefully designed making the file self-contained and portable. It contains formatted metadata not really required by Serva but very important if you plan to share your personally created ServaAsset.inf. It contains the variables required by Serva and the asset boot/install process itself. asset: Variable containing the text that will be displayed on Serva's menu entry. platform: Variable containing the text that will be displayed on Serva's menu entry. kernel_bios: Variable containing the "TFTP path" to the asset's NBP (Network Boot Program) used by BIOS booting clients. append_bios: Variable containing the asset NBP's command line parameters used by BIOS booting clients. ipappend_bios: Optional variable containing "1","2", or "3" (w/o quotes). It appends additional IP/MAC related parameters used by BIOS booting clients. kernel_efi64: Variable containing the "TFTP path" to the asset's NBP (Network Boot Program) used by UEFI 64 booting clients. append_efi64: Variable containing the asset NBP's command line parameters used by UEFI 64 booting clients. ipappend_efi64: Optional variable containing "1","2", or "3" (w/o quotes). It appends additional IP/MAC related parameters used by UEFI 64 booting clients. kernel_efi32: Variable containing the "TFTP path" to the asset's NBP (Network Boot Program) used by UEFI 32 booting clients. append_efi32: Variable containing the asset NBP's command line parameters used by UEFI 32 booting clients. ipappend_efi32: Optional variable containing "1","2", or "3" (w/o quotes). It appends additional IP/MAC related parameters used by UEFI 32 booting clients. 2.3 Making your ServaAsset.inf self-contained and portable. 2.3.1 When creating ServaAsset.inf do not forget to include a correctly populated Description Header; it might look not really important when you deal with one or two non-Windows assets but when that number gets bigger or you are planning to share your ServaAsset.inf with colleagues or friends the extra effort always pays off. 2.3.2 ServaAsset.inf append_xxx variables will surely require some sort of Microsoft share, HTTP or FTP server access. For the sake of consistency when the asset needs a Microsoft share please share the class directory \NWA_PXE\ as NWA_PXE_SHARE. If the asset needs HTTP/FTP access consider Serva's "root directory" (C:\SERVA_REPO) as the "root" of theses file delivery services. 2.3.2 ServaAsset.inf kernel_xxx and append_xxx variables will surely require paths, IP addresses, Serva's computer name, etc. All these components are scenario dependent, that's why Serva is able to parse a set of "environment" variables that help you to create portable ServaAsset.inf files. kernel_bios = ... /SLED-11-SP1-DVD-i586-GM/boot/i386/loader/linux "non-Portable"
kernel_bios = ... /$HEAD_DIR$/boot/i386/loader/linux "Portable"
append_bios = ... install=http://192.168.20.1/NWA_PXE/$HEAD_DIR$/ "non-Portable"
append_bios = ... install=http://$IP_BSRV$/NWA_PXE/$HEAD_DIR$/ "Portable"
2.4 In cases where an identical ServaAsset.inf is able to boot/install more than one particular asset flavor, architecture, or version, we must consecutively list all the tested distributions in ServaAsset.inf header for reference purposes. Before use, the variables asset and platform must be manually edited accordingly to the particular distribution being booted/installed. Format conformant; including its fully populated information header. Self-contained; not requiring any external additional information for its proper use. Portable; being able to be copied to different Serva PXE/BINL repositories requiring minimal to none editing. 2.5 ISO-9660 and its Rock Ridge and Joliet extensions. ISO-9660 (1987) defines how files can be represented on CD/DVD-ROMs. Limitations on the original standard (i.e. file names no longer than 8.3 format) led to the various ISO 9660 extensions used today i.e. Rock Ridge (mostly adopted by the Unix/Linux world) or Joliet (Created by MS; mostly adopted by the Windows world). Most of the Linux distribution ISOs you see today include the original ISO 9660 and both Rock Ridge and Joliet extension encodings. Finally it is always the OS who decides which extension is used at reading time. Linux file systems use case-sensitive file names, symbolic links, and other features supported by Rock Ridge but not supported by Joliet. Therefore when populating Serva's repository by copying content from those Linux ISO files to our Serva PC the Microsoft OS will always read from the included Joliet extension (remember Microsoft OSs do not include native Rock Ridge support) then we must keep in mind a few points. While FILE_NAME.TXT and file_name.txt can coexist on a Rock Ridge or Joliet directory, only one of them can exist on a Microsoft FAT32/NTFS based directory. Rock Ridge soft links are represented as empty files on Joliet. While Rock Ridge supports file names up to 255 chars, Joliet supports file names no longer than 64 chars ("relaxed" Joliet implementations allow longer filenames). Then when copying a file from a Linux ISO to a Microsoft OS (which will be read using ISO's Joliet extension) we "might" end up getting the file with its name truncated to 64 chars. Points 1 and 2 are not very common. Unfortunately there are some Linux install ISOs today using Rock Ridge longer than 64 char filenames distinctive feature and not using a "relaxed" Joliet extension (i.e. certain Ubuntu/Fedora/CentOS/Mageia flavors). Then serving that kind of distro from Microsoft platforms could lead to problems because of those truncated filename files. This option (when on) will additionally try looking for a resource with its name truncated if the resource's original name was longer than 64 chars and not found on a first try. I recommend leaving this option always checked if you are booting/installing Linux or derivatives using Serva's HTTP service. Please do not use on distribution ISOs Rock Ridge features not present on standard Joliet; they do not really help delivering better Linux boot/install systems but they can make PXE booting/installing from Microsoft platforms unnecessarily more difficult. SUSE Linux Enterprise / openSUSE requires Serva's HTTP server offering \SERVA_REPO\ as root. OpenSUSE Live requires Serva's HTTP server offering \SERVA_REPO\ as root. Copy the iso file itself under the head directory. Edit the appended isofrom_sytem variable depending on the booting iso flavor. Red Hat Enterprise Linux / CentOS Linux requires Serva's HTTP server offering \SERVA_REPO\ as root. Oracle Linux requires Serva's HTTP server offering \SERVA_REPO\ as root. Scientific Linux requires Serva's HTTP server offering \SERVA_REPO\ as root. Scientific Linux requires complementary initial ram disk INITRD_N25.1.GZ (672 Kb) providing missing scripts and libraries. Fedora Linux requires Serva's HTTP server offering \SERVA_REPO\ as root. Fedora Linux Server, Fedora Linux Cloud Atomic require Serva's HTTP server offering \SERVA_REPO\ as root. Ubuntu LTS 18.04/16.04/14.04/12.04 Desktop Live requires \NWA_PXE\ offered as MS share NWA_PXE_SHARE with user=serva password=avres. Ubuntu LTS 18.04 and up Desktop Live requires complementary initial ram disk INITRD_N11.2.4.GZ (10 Kb) providing customized init script. Ubuntu LTS 16.04.2 and up Desktop Live requires complementary initial ram disk INITRD_N11.2.2.GZ (10 Kb) providing customized init script. Ubuntu LTS 14.04.3 to 16.04.1 Desktop Live requires complementary initial ram disk INITRD_N11.2.1.GZ (97 Kb) providing customized init script. Ubuntu LTS 14.04 to 14.04.2 Desktop Live requires complementary initial ram disk INITRD_N11.GZ (95 Kb) providing customized init script. Ubuntu LTS 12.04 to 12.02.5 Desktop Live requires complementary initial ram disk INITRD_N02.3.GZ (124 Kb) providing additional drivers and a customized init script. Ubuntu LTS 18.04 Live Server requires \NWA_PXE\ offered as MS share NWA_PXE_SHARE with user=serva password=avres. Ubuntu LTS 18.04 Live Server requires complementary initial ram disk INITRD_N11.2.4.GZ (10 Kb) providing customized init script. ; - 16.04 has a bug; edit the file /.disk/base_installable add a 1 and save it. Ubuntu LTS 18.04 Server / 16.04 Server / 14.04 Server / 12.04 Alternate requires \SERVA_REPO\ offered as HTTP root. Ubuntu LTS 16.04 Server has a bug; edit the empty file /.disk/base_installable add a 1 and save it. Ubuntu 17.10 Desktop Live requires \NWA_PXE\ offered as MS share NWA_PXE_SHARE with user=serva password=avres. Ubuntu 17.10 Desktop Live requires complementary initial ram disk INITRD_N11.2.3.GZ (10 Kb) providing customized init script. Ubuntu 17.10 Server requires \SERVA_REPO\ offered as HTTP root. Ubuntu Mate Desktop Live requires an MS share NWA_PXE_SHARE user=serva password=avres. Ubuntu MATE Desktop Live requires complementary initial ram disk INITRD_N11.2.4.GZ (10 Kb) providing customized init script. Lubuntu Desktop Live requires an MS share NWA_PXE_SHARE user=serva password=avres. Lubuntu Desktop Live requires complementary initial ram disk INITRD_N11.2.4.GZ (10 Kb) providing customized init script. Xubuntu 18.04/17.04/16.04 Desktop Live requires \NWA_PXE\ offered as MS share NWA_PXE_SHARE with user=serva password=avres. Xubuntu 18.04 -17.04 Desktop Live requires complementary initial ram disk INITRD_N11.2.4.GZ (10 Kb) providing customized init script. Xubuntu LTS 16.04.2 Desktop Live requires complementary initial ram disk INITRD_N11.2.2.GZ (10 Kb) providing customized init script. LXLE Desktop Live requires an MS share NWA_PXE_SHARE user=serva password=avres. LXLE Desktop Live requires complementary initial ram disk INITRD_N11.2.2.GZ (10 Kb) providing customized init script. Mint Live requires an MS share NWA_PXE_SHARE user=serva password=avres. Mint 19 to 18.3 Live requires complementary initial ram disk INITRD_N11.2.3.GZ (10 Kb) providing customized init script. Mint 18.2 to 18 Live requires complementary initial ram disk INITRD_N11.2.1GZ (97 Kb) providing customized init script. Mint 17.3 Live requires complementary initial ram disk INITRD_N11.GZ (95 Kb) providing customized init script. Mageia Linux 5 requires Serva's HTTP server offering \SERVA_REPO\ as root. Elementary OS Live requires \NWA_PXE\ offered as MS share NWA_PXE_SHARE with user=serva password=avres. Elementary OS Live requires complementary initial ram disk INITRD_N11.2.3.GZ (10 Kb) providing additional drivers and a customized init script. Debian 9/8/7 Live requires \NWA_PXE\ offered as an MS share NWA_PXE_SHARE user=serva password=avres. Debian 9 Live requires a complementary initial ram disk INITRD_N10.3.2.GZ (2.46 Mb) providing additional drivers and a customized init script. Debian 8 Live requires a complementary initial ram disk INITRD_N10.2.1.GZ (1.58 Mb) providing additional drivers and a customized init script. Debian 7 Live requires a complementary initial ram disk INITRD_N10.1.GZ (540 Kb) providing additional drivers and a customized init script. When using Serva as proxyDHCP the external DHCP server must be able to answer to BOOTP requests; if it fails try replacing ipby=bootp by ipby=dhcp. Debian 9/8/7 Netboot requires netboot.tar.gz content extracted under the corresponding head directory. Debian 9/8/7 Netboot requires Internet access for component download from Debian repositories. Debian 9/8 DVD/CD requires \SERVA_REPO\ offered as HTTP root. Kali Live requires an MS share NWA_PXE_SHARE user=serva password=avres. Kali Live requires a complementary initial ram disk INITRD_N14.5.GZ (333 Kb) providing additional drivers and a customized init script. Tails Live requires an MS share NWA_PXE_SHARE user=serva password=avres. Tails Live requires a complementary initial ram disk INITRD_N26.4.GZ (499 Kb) providing additional drivers and a customized init script. Arch Linux requires Serva's HTTP server offering \SERVA_REPO\ as root. Arch Linux requires a complementary initial ram disk INITRD_N17.1.GZ (71 Kb) providing fixed components and a customized init script. Manjaro Linux requires Serva's HTTP server offering \SERVA_REPO\ as root. Manjaro Linux requires a complementary initial ram disk INITRD_N28.1.GZ (87 Kb) providing fixed components and a customized init script. Zorin OS Live requires an MS share NWA_PXE_SHARE user=serva password=avres. Zorin OS Live requires a complementary initial ram disk INITRD_N03.1.GZ (10 Kb) a customized init script. Puppy Linux (Lucid) requires Serva's HTTP server offering \SERVA_REPO\ as root. Puppy Linux (Lucid) PXE boot requires a complementary initial ram disk INITRD_N01.1.GZ (6.6 Mb) providing net drivers and a customized init script handling the network initialization and file retrieve. Bodhi Linux Live requires an MS share NWA_PXE_SHARE user=serva password=avres. Bodhi Linux Live requires a complementary initial ram disk INITRD_N11.2.2.GZ (10 Kb) providing additional drivers and a customized init script. Linux Lite Live requires an MS share NWA_PXE_SHARE user=serva password=avres. Linux Lite Live requires complementary initial ram disk INITRD_N03.1.GZ (10 Kb) providing customized init script. Deepin requires an MS share NWA_PXE_SHARE user=serva password=avres. Deepin requires complementary initial ram disk INITRD_N22.3.GZ (363 Kb) providing customized init script. Container Linux - CoreOS requires Serva's HTTP server offering \SERVA_REPO\ as root only if the variable cloud-config-url is used. Project Atomic (Fedora/RHEL/CentOS flavors) requires Serva's HTTP server offering \SERVA_REPO\ as root. is a non-PAE i586 server oriented mini distribution. Linux requires Serva's HTTP server offering \SERVA_REPO\ as root. The interactive install will ask you for the HTTP server IP and path to components; remember at that moment you have to provide a full url i.e. as the two first lines of Serva's PXE/BINL menu.def. Serva will display a text version of its menu on COM 1 at 115200 bps. Serva's HTTP server offering \SERVA_REPO\ as root. Custom NBP pxeboot_N07.0 (78 KB). From Serva repository ( IP 192.168.20.1 ) i.e. Available network interfaces are: vmx0 em0 vlan0. Android-x86 requires Serva's HTTP server offering \SERVA_REPO\ as root. Android-x86 7.1-r2 x86/x86_64 PXE boot requires a complementary initial ram disk INITRD_N16.5.GZ (25.0 Mb) providing net drivers and a customized init script handling the network initialization and file retrieve. Android-x86 6.0-r3 x86/x86_64 PXE boot requires a complementary initial ram disk INITRD_N16.4.1.GZ (22.7 Mb) providing net drivers and a customized init script handling the network initialization and file retrieve. For testing available video modes add vga=ask to the append line. After finding a suitable video mode you can permantelly add it to the append line i.e. vga=745. Remix OS requires Serva's HTTP server offering \SERVA_REPO\ as root. Remix OS PXE boot requires a complementary initial ram disk INITRD_N23.1.GZ (11.5 Mb) providing net drivers and a customized init script handling the network initialization and file retrieve. For testing available Bios video modes add vga=ask to the append line. After finding a suitable video mode you can permantelly add it to the append line i.e. vga=745. 6.x/5.x: Editing BOOT.CFG deleting all the "/" from variables "kernel" and "module" (CTRL-H in Notepad). NOTE: please see TFTP problem PXE installing ESXi 6.x on BIOS targets. ;  1-Alternative append considers answer file unattend.xml within head directory. ;    specifying either the ethernet device number or the MAC address of the device. ; NOTE for EFI64: the provided grubx64.efi crashes. Citrix XenServer requires Serva's HTTP server offering \SERVA_REPO\ as root. The interactive install will ask you for the HTTP server IP and path to XenServer components; remember at that time you have to provide a full url i.e. If you use Enforced Windowed TFTP, avoid window-size higher than 4. Hiren's requires its ISO directly copied under the corresponding head directory. UBCD requires its ISO directly copied under the corresponding head directory. Custom initrd initrd_N08.trk (11 MB). BartPE Boot CD requires its ISO directly copied under the corresponding head directory. GParted requires Serva's HTTP server offering \SERVA_REPO\ as root. PartedMagic requires Serva's HTTP server offering \SERVA_REPO\ as root. PartedMagic requires complementary initial ram disk INITRD_N18.GZ (5.7 Kb) providing customized init script. Redo Backup & Recovery requires Serva's HTTP server offering \SERVA_REPO\ as root. Redo Backup & Recovery requires complementary initial ram disk INITRD_N19.GZ (1.2 Mb) providing customized init script and components. Clonezilla Live requires \NWA_PXE\ offered as an MS share NWA_PXE_SHARE user=serva password=avres. Clonezilla Live requires a complementary initial ram disk INITRD_N27.2.GZ (43 Kb) providing additional drivers and a customized init script. ;   Desinfect-201819.iso/software/desinfect-201819-1386.iso must be copied under the corresponding head directory. ;   Desinfect-201718.iso/software/desinfect-201718-1386.iso must be copied under the corresponding head directory. ;   The content of Desinfect-2017.iso/software/desinfect-2017.iso must be copied under the corresponding head directory. C't Desinfec't requires \NWA_PXE\ offered as MS share NWA_PXE_SHARE with user=serva password=avres. C't Desinfec't 201819/2018 requires the content of Desinfect-201819.iso/software/desinfect-201819-amd64.iso or Desinfect-201819.iso/software/desinfect-201819-i386.iso copied under the corresponding head directory. C't Desinfec't 201718 requires the content of Desinfect-201718.iso/software/desinfect-201718-amd64.iso or Desinfect-201718.iso/software/desinfect-201718-1386.iso copied under the corresponding head directory. C't Desinfec't 2017 requires the content of Desinfect-2017.iso/software/desinfect-2017.iso copied under the corresponding head directory. C't Desinfec't 201819/2018 requires complementary initial ram disk INITRD_N09.4.GZ (10 Kb) providing customized init script. C't Desinfec't 201718 requires complementary initial ram disk INITRD_N09.4.GZ (10 Kb) providing customized init script. C't Desinfec't 2017 requires complementary initial ram disk INITRD_N09.3.GZ (98 Kb) providing customized init script. KRD requires requires Serva's HTTP server offering \SERVA_REPO\ as root. KRD requires complementary initial ram disk INITRD_N24.1.GZ (10.5 Mb) providing customized scripts and kernel modules. For BIOS clients MemTest86 (Site Edition only)/Memtest86+ boot CDs require the ISOs directly copied under the corresponding head directory. Firmware Test Suite (fwts) requires an MS share NWA_PXE_SHARE user=serva password=avres. Firmware Test Suite (fwts) requires complementary initial ram disk INITRD_N11.2.5.GZ (96 Kb) providing customized init script. ;  Shell command line parameters are passed in the append_efi64 variable. ;  You must boot a Shell compatible with your particular UEFI client. UEFI Shell command line parameters are passed in the append_efi64 variable. ;      device-name - fully qualified NT path name of the drive to check. ;     drive-name - fully qualified NT path name of the drive to check. device-name - fully qualified NT path name of the drive to check. drive-name - fully qualified NT path name of the drive to check. Note: This set of EFI applications can permanently alter the information contained on disk devices; extreme care must be taken when offering these assets. HP Service Pack for ProLiant requires an MS share NWA_PXE_SHARE user=serva password=avres. Copy the ISO file itself under the head directory and update ServaAsset.inf append variables when necessary. Lenovo Bootable Diagnostics requires \SERVA_REPO\ offered as HTTP root. Lenovo Bootable Diagnostics requires a complementary initial ram disk INITRD_N10.2.2.GZ (96 Kb) providing a customized init script. Lenovo Bootable Diagnostics requires \NWA_PXE\ offered as an MS share NWA_PXE_SHARE user=serva password=avres. Lenovo Bootable Diagnostics requires a complementary initial ram disk INITRD_N10.2.GZ (762 Kb) providing additional drivers and a customized init script. Samsung SSD Firmware Update requires its ISO directly copied under the corresponding head directory. Crucial SSD Firmware Update requires its ISO directly copied under the corresponding head directory. DOS/FreeDOS requires its IMG file directly copied under the corresponding head directory. DOS/FreeDOS images can be easily customized including i.e. BIOS upgrade executables. On Windows environments by using i.e. WinImage. On Serva PXE/BINL - AN02: Windows Install Adv & WinPE Boot we have seen how Serva's repository strategy can be split when booting from Serva other repositories like WDS/MDT/SCCM, etc. In those cases Serva TFTP delivers only a Boot.wim that contains the information to boot and connect to the services/resources offered by WDS/MDT/SCCM own stores. In the Linux world something very similar happens. Initially Serva TFTP delivers a small Linux executive made of a kernel file and a small file system (ram disk image) usually compressed into a single file. When booting, this executive receives as command line parameters the transfer protocol and the network location of the repository offering the bulk of the boot/install components. The difference between Microsoft and Linux strategies at this point shows how Microsoft today relies on an image based deployment (i.e. Install.wim) while Linux still uses the conventional multi-file transfer approach. So far all the presented Linux ServaAsset.inf files on this AN give instructions to the booting kernel for retrieving the rest of files using HTTP or MS share services pointing back to Serva itself. You can easily change this making the kernel to look for the required resources in some other HTTP, NFS, FTP server etc. (including Internet hosted servers). Always remember on these situations Serva repository will still need to keep under its control the corresponding initially TFTP transferred components of the installation. 9.1.1 Variables kernel and append use paths to network retrieved resources. Making mistakes when writing these paths is a very common source of frustration. If you ever get a path that looks like i.e. you know you are in trouble; the kernel vmlinuz is a file that will always be delivered by TFTP then its path cannot ever begin with "C:". Any time you see a local disk reference on the path of a network transferred resource you surely made a mistake. Whenever you write a path start thinking of the protocol that will transfer the associated resource (TFTP, HTTP, FTP, CIFS, etc ) and then consider where is the corresponding service root directory pointing at. Surely this way you will make fewer mistakes. While the first one makes an absolute reference to the TFTP root the second one makes a relative reference. This is a common mistake when chain-loading NBPs (Network Boot Programs). 9.1.3 Please consider (specially if you have no much Linux experience) there are situations where one of these two paths could lead to an error. While the first one is the typical "MS Windows" form of a path the second one is the typical "Unix/Linux" form of a path. Please consider not every piece of code out there is able to handle both forms. 9.1.4 Multi-homed Linux (and derivatives) booting interface. Multi-homed Linux system are known for sometimes presenting problems on PXE scenarios when choosing the booting network interface. A ServaAsset.inf working on a single-NIC system might fail on a multi-NIC situation. Most Linux distributions have kernel parameters (i.e. netdevice=bootif) or pxelinux parameters (i.e. ipappend_bios = 2) that help in solving this problem. The PXE boot/install process of Linux distributions initially TFTP transfers the corresponding kernel and initrd files. Next the just booted executive will retrieve the rest of components by using more robust protocols like HTTP, CIFS, NFS. 9.2.1 Linux aborted installs because of failed HTTP transfers. Some Linux distributions (i.e. Live Ubuntu/Debian and derivatives) require \NWA_PXE\ offered as an MS share NWA_PXE_SHARE with user=serva and pass=avres. A NWA_PXE_SHARE with a different user/password can be used but it requires updating the user= and pass= parameters of the corresponding ServaAsset.inf append line/s. The SMB (Server Message Block) protocol used by Microsoft shares implements the "CIFS" dialect. 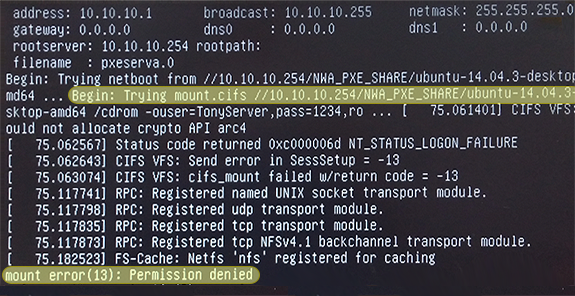 A booting client will perform a mount.cifs command against NWA_PXE_SHARE as part of the init script. The set of parameters controlling this mounting process can be found in the mount.cifs(8) Linux man page and they are passed to the kernel as the NFSOPTS append variable i.e. NOTE: NFSOPTS payload cannot contain spaces, commas are used as parameter separator. 1) The client requires missing CIFS drivers provided by a not loaded complementary INITRD_NXX.GZ file. 2) As the consequence of a previous mount error(22): Invalid argument error (see 9.2.3). 3) As the consequence of a previous mount error(13): Permission Denied error (see 9.2.4). This error can be seen when the variable NFSOPTS i.e. presents unsupported or unspecified parameters/values. Either the SMB protocol version, security mode, etc. were not explicitly defined when needed or some of their defined values like sec=XXXX,vers=YYYY,etc. were not supported by the client. 1.0 	 - The classic CIFS/SMBv1 protocol. 1) Client and server using the same SMB version. 2) Client and server being able to "negotiate" the same authentication protocol. 3) Include the domain (or Workgroup) definition on client's requests if the server requires it. Note: SMBv1/CIFS is not installed by default in Windows 10 Fall Creators Update and Windows Server, version 1709 and up. Please read Microsoft's article. If you need SMBv1 you can make it available by using "Turn Windows features on and off".